Emperor penguins on the world’s coldest continent have recently been observed sitting in traffic. Temperatures as low as -60°F have forced these Antartican creatures to huddle in large masses to conserve energy and keep their young warm. In contrast to humans in a traffic jam, these penguins work together and act as one unit. 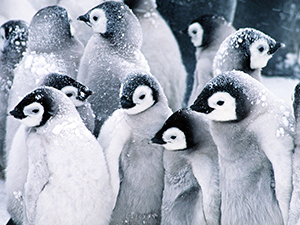 An international research group discovered that when a single penguin in the huddle moves even just one inch, the whole group adjusts to the movement. Other birds stick together like penguins, too. “What makes emperors different is that they try to limit the space between them [for heat],” said University of Erlangen-Nuremberg physicist Richard Gerum. Gerum also suggested that if people in traffic jams could work together like penguins do, they could develop a better traffic flow and reduce car crashes. Maybe it’s time we take a page out of the penguins’ book.